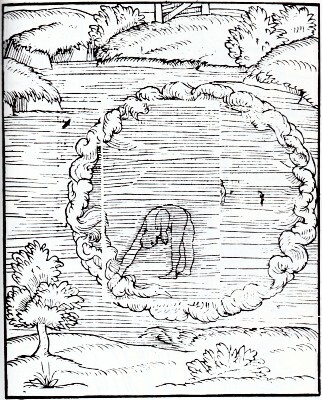 christopher middleton : digby's art of swimming, 1595.
translated from Digby's De Art Natandi, 1587. Everard Digby (born c. 1550) was an English academic theologian, expelled as a Fellow of St John's College, Cambridge for reasons that were largely religious. 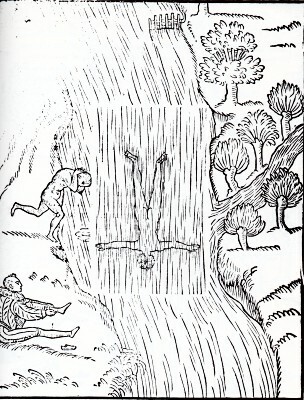 He wrote the first book, De Arte Natandi and written in Latin, published in England on swimming in 1587. 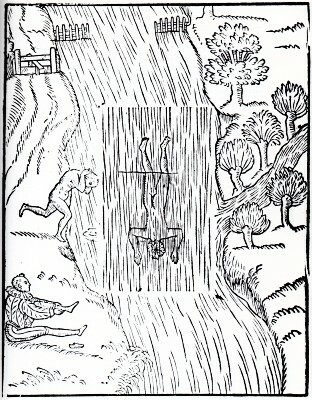 It was a practical treatise following a trend begun by the archery book Toxophilus of Roger Ascham, of Digby's own college. 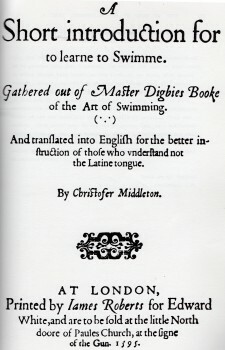 In 1587, Digby's latin text was translated into English by Christopher Middleton and published as A Short Introduction for to Learn to Swimme, gathered out of Master Digbies Booke of the Art of Swimming, and translated into English for the better instruction of those who understand not the Latin tongue in 1595. 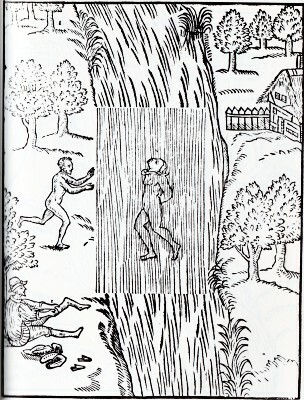 Middleton edited Digby’s historical digressions and theorising, and concentrated on the practical chapters, including the original woodcuts illustrating persons swimming. 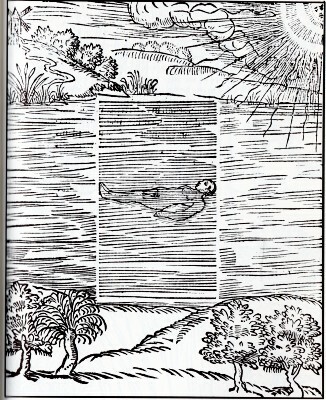 The treatise outlines the two standard forms of simple floatation, floating (#21) and treading water (#23), along with numerous styles of swimming, although in many cases these are only minor variations. The major styles are breast stroke (#2), dog paddle (#14), and swimming on the back (#16, 17 and 18). 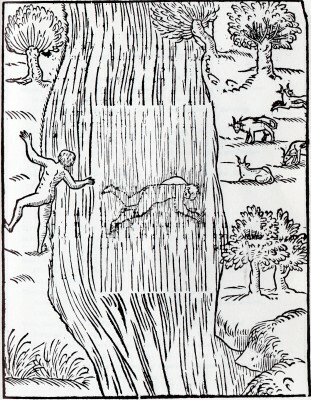 The later sections detail diving and swimming underwater (#34 to 39). 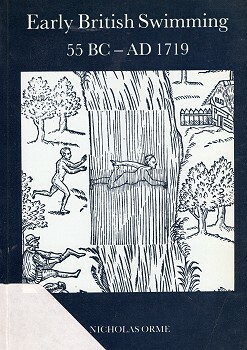 The book was reprinted in Nicholas Orme's Early British Swimming 55 BC - AD 1719 (1983). The page numbers are from Orme. These directions are sufficient either for his entrance which is yet to learn, or for his which is already expert in this faculty. 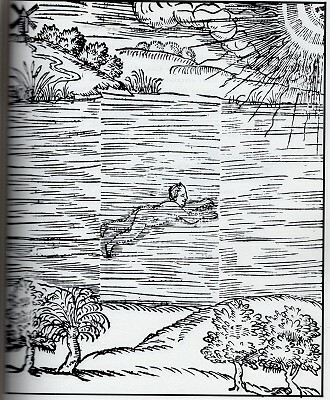 Now that is learning to swim, as we said afore, having waded in up to waist or somewhat higher, laying himself easily along upon the water with his belly downward, and striving as much as he can to hold up his head, and draw[ing] in his arms close to his breast, holding hands broadways together under his chin with the palms down; let pull his feet from the bottom and withal put forth his hands as far as he can and draw them in again as afore, and likewise his feet. Which double motion of hands and feet serve to this use: the one thrusteth him forward and the other keepeth up his body. And because it is a toil, something to learn how to strike right thus with his hands and feet as afore, let him either get someone to accompany that may by holding his hand under his chin keep him from sinking, else take two bladders, blow them full of wind and fasten them so together that he may have them to lie under his armholes, which will easily bear him up. 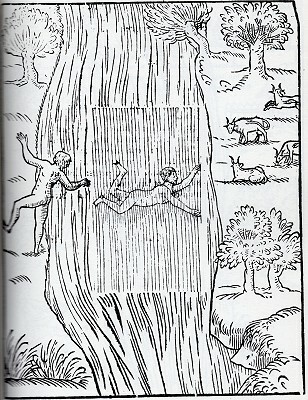 Into this kind of swimming many do at the first fall, before they perfectly learn the right stroke. 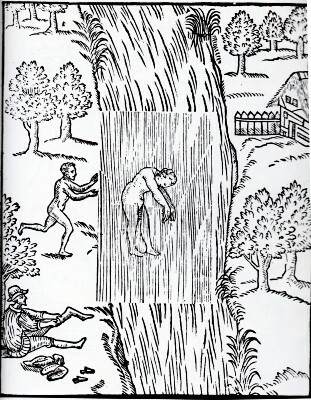 His hands must he hold before his head with their backs together, that they may be ready to pull him as it were forcing him down under the water, and he must, pulling them out and in, now use them to help him down which were afore a means to hold him up. He must swim under the water as afore but as near the bottom as he can, so that he touch it not lest he raise any mud to thicken the water, his eyes open that he may see where it lieth. 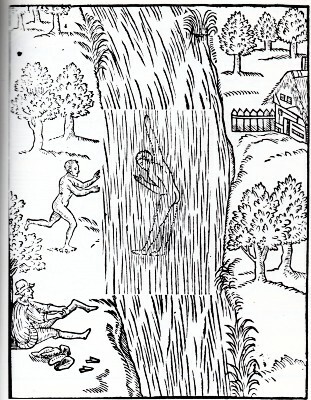 Geoff Cater (2014) : Christopher Middleton : Digby's Art of Swimming, 1587.